Color of Violence 4 is working along with the hotel staff to make the Hyatt as accessible as possible. a) If you are staying in the hotel--Fill your in-room Fridge with Real Groceries to avoid the hotel restaurants! You can order using our local grocery delivery service called InstaCart. Order with friends to share the service fee ($3.99 + tip). b) Your conference registration badge is good for a 10% discount at the hotel restaurants, Forno and Shor. c) There are excellent local restaurants a short distance from the hotel. We will have a list available at registration. d) The Daily Grind Coffee Shop located inside the Hyatt will run a coffee & pastry special for everyone with a COV4 registration badge. e) Check with the information and registration tables for other solutions if these do not work for you. What strategies are available to people with Scent & Chemical Sensitivities? a) Your room--please note this in your reservation when you book online, call the front desk and request this be placed on your reservation notes—or email COV4incite@gmail.com for assistance in setting this up. These rooms will be cleaned with a low scent soap and will have shampoos and soaps removed before check-in. b) The Healing Justice Practice Space room will not be chemically cleaned on the day the conference starts and will be locked throughout the conference so that cleaning does not happen over-night. c) We have ordered face masks for anyone who needs them. These will be kept in the Healing Justice Practice Space (HJPS). d) The healers in the HJPS space will offer some herbal relief options. Will there be All Gender Bathrooms? In a word, YES. Both of these locations are easy to find on the map. Is the space wheelchair accessible? Yes, the hotel is newer and ADA compliant. How far are the workshops from each other? How much walking is needed? The hotel is very big. The workshops, marketplace, breakout sessions and All Gender Bathrooms are all very close together. HOWEVER, the ballroom and sleeping rooms are further away and many people might find this distance far to walk. We have asked the hotel to have extra chairs set up around the hotel and to make sure that these chairs do not have arms. They are going to do this, but there are areas where no chairs can be placed due to fire codes and other access concerns. The hotel is connected to a large convention center called the McCormick Place. The McCormick is connected to the hotel through an accessible flat skywalk. The McCormick Place has a Scooter Rental Service. The scooter rental has a 3 day rental minimum--you choose which days of the conference make sense for your travel. The cost is $50 per day (if you pick it up at the convention center). If you want it delivered to the hotel, there is a flat charge of $25. The total cost with delivery for 3 days is $175. The total cost without delivery for 3 days is $150. What are the seating options in the hotel? We have requested armless chairs in all workshops, breakouts and the ballroom session. We have also requested the hotel place chairs around the hotel so that there are additional seating areas. Are there self- care spaces for self–reflection, prayer, lactation, napping and quiet? a) Healing Justice Practice Space: This space will have healers present, be low scent and have offer a retreat space from the rest of the conference. This space is open for lactation, prayer, napping and quiet. b) Quiet Room: Located on the 3rd floor, this room will be away from the rest of the conference and have couches for naps, lactation, quiet or prayer. c) Disrupting the State Art Exhibit: This incredible art exhibit of community artists will provide an environment for self- reflection and quiet. Is there a place for children to go? Yes! We have a full Children’s Track being coordinated by ChiChiCo, the Chicago Childcare Collective. Check it out here for more information. Please register children in advance for this track. 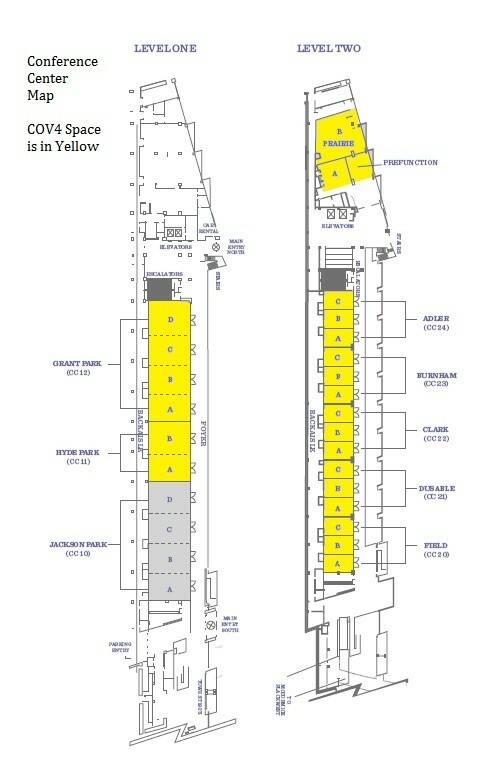 What is the layout of the conference space?